I bumped along a dirt road in the back of a 4×4, squeezed in with a team of ten vaccinators with the aim of reaching a remote village 60km from the already remote Kapoeta in South Sudan. Our mission – to bring vaccines to children who wouldn’t otherwise get the protection against basic but killer childhood diseases. Women and children adorned in beads and bangles appeared alongside the roadside carrying large bundles of wood and water on their heads and then silently disappearing into the bush. Twice the road was almost impassable and the vehicle came to a squelching halt as it sunk into thick mud – caused by the recent rains. Once we got a puncture – down to the appalling road conditions. Eventually, two hours after we had started our journey we were a stones’ throw from our destination. Only a deep quagmire stood between us and the children we’d come to vaccinate. 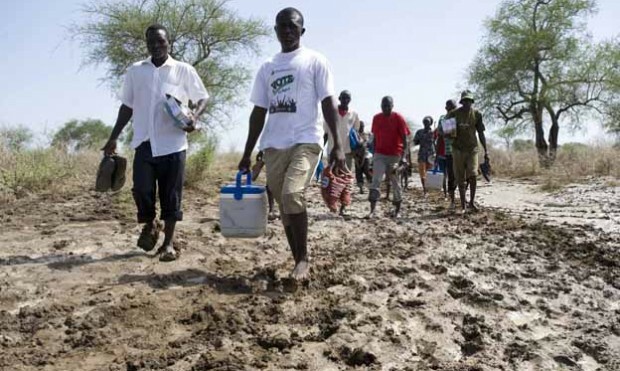 Used to the routine in these circumstances the team of vaccinators rolled up their trousers, took off their shoes, gathered the vaccines together and set off through the mud, sinking up to their knees in places. This is just one of many challenges getting vaccines to children living in the remotest parts of South Sudan – a country that only has 50km of tarred roads and less than 30% of the population has electricity. Lazarus, who heads up the vaccination team, told me what a worry it is every morning and evening when he checks the temperature of the solar powered fridge. Will the temperature be cool enough to store the vaccines? If the fragile power fails and the vaccines warm to more than 8 degrees they can’t be used. And more southern Sudanese children aren’t protected from the six main killer diseases – measles, polio, diphtheria, whooping cough, tetanus and tuberculosis. When we did finally reach Lokoges village it didn’t take long before we were surrounded by children, and queues of mothers and their babies started forming under the tree where the mobile vaccine station was being set up. Louri is one of the lucky ones. When South Sudan becomes the world’s newest country on 9 July 2011 it will have the dubious boast of having the worlds lowest vaccine coverage rate – 17% of children are vaccinated compared to 94% in the UK. In another village, I met Lotabong who had given birth to eight children. In quiet tones she told me that two of her children had died from measles and a further one from diarrhoea. She didn’t know that there were vaccines to prevent measles at the time. She does now though and encourages all the mums with small babies in her village to take them for their immunisation so they don’t suffer loss like hers. She told me: “If you meet the world leaders you must take them this message. We must not let voices like Lotabong’s go unheard. When David Cameron and other world leaders meet on Monday at a global vaccine summit in London they have a make-or-break opportunity to help save the lives of four million children. The Global Alliance for Vaccines and Immunisation is facing a shortfall of £2.3bn for its work over the next five years. Without full funding, many children – like those of Lotabong – will continue to die from vaccine-preventable diseases every year.